New and more efficient cooling methods are needed to reduce the energy consumption and environmental impacts of residential, commercial, and industrial space cooling and refrigeration. Air conditioning accounts for about one-sixth of U.S. electricity demand, while refrigeration equipment at homes and businesses consumes more than 1.1 quadrillion British thermal unit (BTU) per year. Adding to the environmental challenge, the refrigerants typically used in freezers are potent greenhouse gases (GHG) with atmospheric heat-trapping potential thousands of times that of CO2. Even well-engineered systems leak refrigerant over time: a typical supermarket freezer system in the United States, for example, can contain 3,000 – 6,000 pounds of refrigerant and lose 10% – 25% of its charge annually. Cooling is also an economic and competitive challenge, as it can comprise 50% – 70% of a supermarket’s energy costs. Stirling cycle machines have a theoretical coefficient of performance (a measure of cooling system efficiency) as high as 13 (for typical air-conditioning temperatures), roughly four times greater than the U.S. DOE’s recently upgraded minimum energy efficiency standard. In contrast to other emerging cooling or refrigeration technologies, they use conventional materials and manufacturing processes, and can be adapted to use non-toxic, non-flammable and low-to-zero global warming potential (GWP) refrigerants such as helium. The key to unlocking the high efficiency potential of the Stirling cycle lies in maximizing the efficiency with which the heat is exchanged, or pumped, between the hot and cold sides of the cooler, allowing for the maximum potential external temperature drop. To date a major fraction of the hot-to-cold cycle temperature drop has been lost internally in the device’s heat exchangers, effectively depriving Stirling machines of the large temperature swings that they require to run at peak efficiency. Recent developments of Stirling engines for space applications and for concentrated solar power systems have improved the technology. The resulting optimization of the base engine design, although configured for electricity production, provides a platform for the development of Stirling-based coolers. The Stirling configuration, in turn, provides the opportunity to replace existing high-GWP refrigerants used in vapor-compression-based systems with non-toxic, low (or zero) GWP refrigerants. 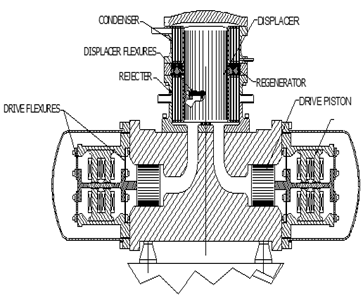 Figure 1: Stirling cycle free piston freezer. The linear piston assembly (the horizontal cylindrical structure) creates a cyclic pressure wave that couples to the driver in the cold-head (the vertical cylindrical structure). The original goals for this project were to create a small-scale (12,000 BTU/hr) air conditioning system that uses low GWP refrigerants while delivering a high COP at competitive cost. ITC began with a model-based technical and economic analysis to create a blueprint for the commercialization of the Stirling-based device. ITC used computational models to optimize its innovative heat exchanger design, incorporating heat pipes and, later, thermosiphons. Although the team was able to use ITC’s core Stirling technology, the system required substantial modification for the transformation to the cooling configuration, with its small DT, and its requirement for green refrigerants. As the designs for air conditioning applications matured, technology-to-market activities and initial testing revealed improved energy efficiency with the potential for use in military cooling applications. As a result, ITC has continued to develop a Stirling air conditioner for use in extreme environments under a joint DoD-ARPA-E program. For commercial markets, there is clear potential to deliver value in other applications that have higher temperature differences, such as refrigeration. Under these conditions, the coefficient of performance has shown the potential to reach 1.4 at higher ambient temperatures, which is an improvement over that of existing refrigeration systems. Coupled with the substantial benefit of not using harmful synthetic refrigerants, ARPA-E and ITC agreed to modify ITC’s award to include the parallel development of systems for commercial freezers for food service. The target COP was set to 1.4 in a 24,000 BTU/hr refrigeration system. ITC designed and implemented a prototype refrigeration unit, which uses Helium as the working fluid and a CO2-based external heat transfer loop. ITC has engaged a commercial refrigeration equipment company to assist in commercialization and tested the unit at that company’s facilities in late 2015. The results demonstrated a baseline COP of 1.0 with technical pathways identified to increase COP to the target value of 1.4. In addition, the system displayed other traits desirable to refrigeration customers. These include very quiet operation, the ability to be deployed in modular fashion (limiting complex networks of pipes within a store), highly efficient and infinitely variable partial load operation, and rapid temperature pull-down (which maintains safe freezer interior temperatures when the freezer door is repeatedly opened and closed, as in retail applications). ITC is working with its commercial partner to take the project to the next stage of development. The first step will be to redesign the system to improve its performance and to reduce the overall system cost. Thereafter ITC will fabricate, assemble, and test three additional coolers which will undergo laboratory and field testing at prospective customers’ sites in the food service industry. The commercial partner will recruit the test customers, conduct a detailed cost study and undertake major pre-production tasks, such as design for manufacturing and assembly, production part analysis, and distribution and service channel development. This project has demonstrated the potential for a commercially-viable refrigeration system that is an innovative alternative to conventional refrigerant-based vapor compression systems, without the use of high-GWP refrigerants and without compromises in energy efficiency. Success in applying the system to refrigeration has the potential to enable future development of the ITC system as an air conditioner as well, with significant potential to cut costs, improve human thermal comfort, and reduce greenhouse gas emissions.